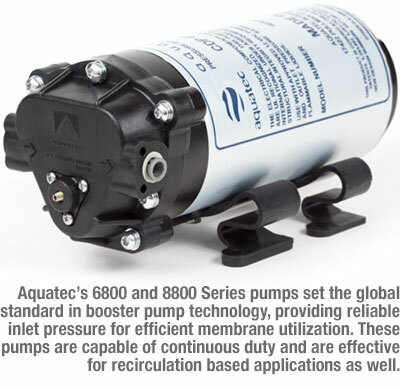 Aquatec International is a leading manufacturer of precision diaphragm (membrane) pumps and related flow control components. For over three decades, Aquatec has produced the highest quality, most reliable electric diaphragm pumps available in the global marketplace. Every Aquatec pump is proudly assembled within our modern Southern California production facility. Leading global manufacturers trust Aquatec pumps to satisfy a wide range of system requirements, including those related to Water Purification, Medical Devices, Automotive Care and Performance, Industrial Floorcare, Road Maintenance, Commercial Food & Beverage Service and Solar Water Pumping. Our pumps are designed to deliver flow rates up to 6 gal/min (22.7 l/min) and operating pressures up to 220 psi (15 bar). We offer our OEM customers an unparalleled level of model customization. Our experienced sales and engineering teams can help determine the optimal configuration for any given application. We’ve been awarded over two dozen international patents related to our innovative pump designs and their capabilities. We work on a factory direct basis with OEM customers in 30+ countries, though many of our most popular pump models are also distributed globally through our distributor network. Our founder and Chief Engineer, Ivar Schoenmeyr, often says that “better pieces make better pumps”. All Aquatec pumps are assembled using only the highest quality components, including proprietary elastomer formulations, high grade fasteners, and powder-coated diecast parts. Aquatec pumps exclusively utilize our non-perforated, single-piece diaphragms which help eliminate any leak potential as neither screws nor assembly fasteners are ever secured through the diaphragms themselves. Aquatec pumps utilize a patented clamping system that ensures exceptional overall product life at consistent, high operating pressures. Aquatec’s patented diaphragm wobbler construction improves product performance and increases pump life due to unique geometry and available anti-friction coating. Aquatec’s U.S. manufactured motors use extra heavy gauge motor shells and the highest-grade ceramic magnets available. This ensures maximum torque and operating efficiency, enabling our pumps to operate at either higher pressures or lower amperages than competitive models. Aquatec’s in-house motor manufacturing capabilities also ensures our ability to satisfy specific OEM application requirements. We also produce specially sealed motors for applications where the pumps may be subjected to harsh chemicals or weather conditions.